The Urban Condominium. Located in Pattaya City, between Pattaya Second Road. and Soi Bua Khao. 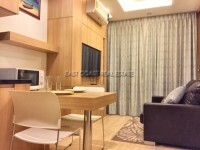 This location is very convenience for those people who want to be near the night life or all amenities in town. Facilities of the buildings are: 24 h Security, key card access into the building, maid service, communal swimming pool, gymnasium, library, Free WiFi & Free Cable TV. Available for rent with a long term contract of 6 months+. The rental price is 22,000 Baht per month.